With so many different titles for dental professionals, it can be hard to nail down exactly what each really means. This confusion is completely understandable, since most health professionals share common aims, and all dental professions work in some capacity with the mouth. The principle similarity between each branch of dentistry is our shared goal: to keep people healthy and happy with the way they look. That said, we each have our own specialty; each branch has a unique, extensive body of knowledge attached that makes its mastery a lifelong commitment. The mouth is a complicated place, and the best way to care for it is with multiple specialists who know whatever there is to know about a specific problem, area, or treatment. Of course, each individual dentist has a comprehensive framework of knowledge on which to build this specialization. Let’s take a moment to define some specialties. You might compare a general dentist to a primary care doctor in general medicine. At these offices, you’ll find healthcare services like teeth cleaning, cavity filling, root canals, etc. They keep your teeth healthy and looking great. As you might have guessed, general dentists have obtained a doctorate and have gone through a licensure process. Make sure to see your dentist at least once a year; we recommend stopping by every six months. Just like any other field in healthcare, more monitoring means a better chance of catching problems before the progress very far. These fields of dentistry deal with specific, specialized challenges. In fact, most people will never see a periodontist or maxillofacial surgeon. If you do need their services, though, their expertise is invaluable. A periodontist specializes in the care of what’s called periodontium. This includes alveolar bone, gums, and ligaments. Mostly, they help fight diseases resulting from bacterial infections. Maxillofacial surgeons specialize in surgical care for periodontium and other facial bones. They often see patients who’ve had facial injuries resulting from physical trauma, bacterial infections, and cancers of the neck or mouth. These specialists often work closely together to create comprehensive treatment plans. Orthodontics is the branch of dentistry that corrects teeth and jaws that are positioned improperly. The importance of orthodontic care and a knowledgeable orthodontist cannot be overstated. To be a licensed orthodontist, one must attend an ADA-accredited orthodontic residency program. These are usually three additional years of full-time training. For example, Dr. Mateer completed his undergraduate studies at Marist College, with a Bachelors Degree in Biology. He attended Stony Brook University School of Dental Medicine, where he graduated at the top of his class. Upon completion of his dental degree, he then attended Montefiore Medical Center where he received his specialty certificate in Orthodontics. Here he underwent extensive training in Orthodontics on patients of all ages using the most state of the art techniques. He is also a member of the American Association of Orthodontics and the American Dental Association. While orthodontics does address cosmetic issues, there are many issues that orthodontists treat that are essential to ensuring proper oral health for you and your family. Teeth that are crooked or not in the right place can detract from one’s appearance, but more importantly, crooked teeth and teeth that do not fit together correctly are harder to keep clean. This puts your teeth at risk of being lost early due to tooth decay and periodontal disease. The misalignment can also cause extra stress on certain enamel surfaces, which can chip or break down. Outside of general dentists, orthodontists are the most commonly seen dental professionals. That’s because many people deal with misaligned teeth and jaws, which is what an orthodontist specializes in. Any time you see someone with braces or clear aligners on their teeth, they’ve more than likely been to an orthodontist. When a patient comes in for his or her first consultation, our team will precisely diagnose orthodontic issues and offer solutions that workmost effectively. Many times, our patients need these treatments to avoid physically painful symptoms. When teeth are pushed together in ways they shouldn’t be, it can lead to increased plaque build-up and tooth decay. While regular dental cleanings can prevent some of this, it’s best to look into all the options, such as straightening your teeth, in order to decrease the chances of a tooth extraction becoming necessary. Crooked teeth and misaligned bites can result in teeth grinding. It’s important to identify and stop this habit early. Orthodontists provide solutions for those who grind their teeth unconsciously during the night. Other malocclusions—especially crossbites—result in increased pressure on certain molars, and the underlying tissue and bone. More pressure means inflammation, and increased chances of infection. Yikes! Along with these and other physical symptoms, orthodontic issues can also substantially affect a patient’s self-esteem. This can be more serious than it seems at first. For many, the development of crooked teeth at a young age shapes the way they think about their smile, and ultimately their self-image. Most don’t think consciously about these effects, but that doesn’t mean their behavior isn’t influenced. Perhaps a person doesn’t smile where they might have if their teeth were straight. To prevent both physical and psychological effects, Mateer Orthodontics provides non-invasive solutions like Invisalign, as well as traditional braces. Come See Us At Mateer Orthodontics! Outside of visits to your general dentist, we recommend regular check-ups with an orthodontist to ensure a straight, healthy set of teeth. Regular check-ups may allow us to prevent problems before they get very far along, especially in adolescents and children. It all starts with an initial consultation, and we’d love to see you! 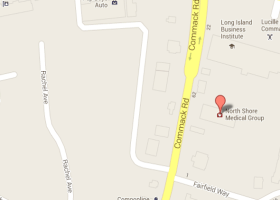 Give our Commack, New York office a call at 631.462.1970, or drop us a line here.